Anakin Skywalker has apparently fallen on hard times now that the “Star Wars” franchise is moving on without him. Guy can’t even get a Death Star mortgage application approved. On Monday, a 5’5” man dressed as Darth Vader entered Pineville, North Carolina’s State Employees Credit Union with a rifle (which seems kinda pointless when you could just open the vault by waving your hand) and basically told employees this is a Sith-up. He escaped with an undisclosed amount of money, UPI reports, though it’s in the thousands. “You see all kinds of disguises here and there, but this one in my experience is the most unusual,” Lt. Corey Copley told local news station WCNC. The man drove away in a Chevy Suburban, not an authentic TIE Advanced x1 starfighter, and nobody got hurt in the robbery — which isn’t authentic either, but is definitely a good thing. Police are now asking residents to identify anyone they know who owns such a costume. 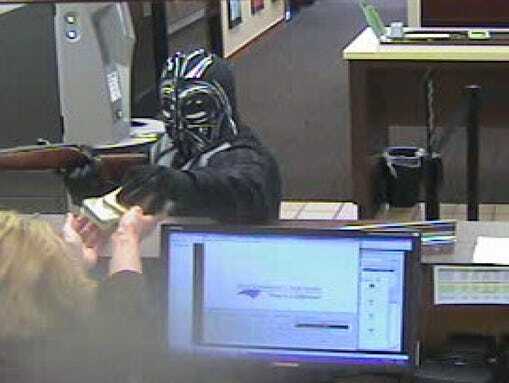 If you live in N.C. and dressed as Darth Vader for Halloween, you’re pretty much a prime suspect. “He has shown somebody that he’s got this and hopefully the person, one of your viewers, will be able to see and call and give us some tips on that,” Copley said.